Alex Escobar - 2 seasons (2003-2004) - In a bone-headed move, the Indians and Mets came up with an 8-layer swap which basically gave Roberto Alomar to the Mets for Alex Escobar. I know, I often bemoan Cleveland's knack for serving as the farm team to the rest of MLB, but dang, Roberto flippin Alomar!? I digress. Escobar came to the Tribe in 2002, and managed to tear his ACL during Spring Training, so he didn't get to play until 2003. He played in 28 games, batting 99 times that year. His 16 runs on 27 hits with 27 hits, 2 doubles, 5 homers and 14 RBIs brought him a .273 average. The next season, he batted in 46 games (152 at-bats, 32 hits, 20 runs, 8 doubles, 2 triples, and just one homer) and his average dropped to .211. Andy Allanson - 4 seasons (1986-1989) - Allanson helped turn the bumbling Tribe of the mid 80's around in 1986. He was named the Topps All-Star Rookie (which you see the golden cup on his card). His batting wasn't bad, but his consistency defensively (3 out of 4 seasons had .986 fileding average). Speaking of batting, though, his Indians career covers 1,204 at-bats with 296 hits. On those, he got 121 runs, 33 doubles, 4 triples, and 12 homers. He also managed to strike out 176 times (ouch, that's basically 60% of the time). He left the Tribe with an overall batting average of .246. Bill Glynn - 3 seasons (1952-1954) - Glynn is one of the 336 players who have managed to hit three home runs in one game (his came on July 5, 1954). In his first season with the Tribe, he had 92 at-bats and got 15 runs on 25 hits, bringing in 7 other guys. His first year as an Indian netted him his highest career average: .272. In '53, he got 100 hits on 411 at-bats in 147 games. His 65 strikeouts helped him drop his average to .243, and in '54 he had 171 at-bats in 111 games. Un fortunately, his stats were still down (43 hits, 19 runs) and despite his 3 homers-in-a-game that year, he ended his baseball career with a .251 average. He also managed to earn a .500 average (1 double and 1 strikeout) in the 1954 World Series. Not too bad of a way to end a career, I'd say. Billy Harrell - 3 seasons (1955, '57-58) - Harrell played in only 13 games his rookie year. He had 19 at-bats and only struck out 3 times. He had 8 hits, 2 runs, and a single RBI, all of which add up to a rookie year .421 batting average. He was out for the '56 season, and his return in '57 gave him 57 at-bats with 6 runs on 15 hits (.263 avg). The next year, he batted 229 times in 101 games, and watched his average fall to .218 before giving him up to the Cardinals (who ultimately lost him in a Rule 5 draft to the Red Sox). Bip Roberts - part of 1 season (1997) - If you are going to play for the Tribe for only one season, then playing for them when they go to the World Series ain't a bad gig. He batted in 23 games, making 85 appearances at the plate. His 23 hits, 19 runs, 3 doubles and 3 home runs drove in 8 RBIs for a .248 batting average. In the World Series, he went 6 for 22, giving him a .273 WS avg. 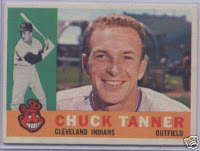 Chuck Tanner - 2 seasons (1959-60) - Tanner previously appeared in our countdown wearing Number 5. He is one of the players that wore multiple numbers, and he wore 5 and 6 during the 1960 season (he wore #26 in '59). Here's a refresher: As a Triber, he played in 35 games total, scored 9 RBIs on 8 runs (19 hits, 15 strikeouts) and came up with a .250 in '59 and .280 (his 2nd highest average) in 1960. Dave Pope - 3+ seasons (1952-55, 56) - Pope wore Number 34 for most of his Indians career. He came to the Indians in '52, and wore the Number 6 during his rookie year. He batted in 12 games, and his 34 at-bats netted 10 hits with 9 runs (1 double, 1 triple, 1 homer, and 4 RBIs), giving him a .294 average. David Bell - 2 Seasons (1995, 1998) - Bell wore Number 6 during his sting with the Tribe in 1998. If the name seems familiar, it is because he wore the Number 4 in 1995. Here's a recap: he shares his name with two other "David Bells" - an alleged ghost of Bell House in Georgia, and former Triber David (better known as BUDDY) Bell. He began his MLB career with the Indians by stepping up to the plate twice and getting nowhere fast (goose-egg average). The Tribe traded him to the Cardinals, and in 1998, they picked him back up again. This time, he batted 340 times for 37 runs, 89 hits, 21 doubles, two triples, and 10 home runs. He scored 41 RBIs and struck out 54 times. The Tribe sent his .262 average to the Mariners later that season. Doc Edwards - 1+ seasons (1962, part of '63) - Edwards (who was a Navy medic) wore Number 25 in his rookie year and Number 6 his 2nd year. In that 2nd year, he batted in 10 games for 31 at-bats. He got 6 runs on 8 hits, 6 strike outs and 2 doubles, leaving his Indians playing career with a .258 average that year. He actually came back to the Tribe in 1967, but he was traded away before he could don an Indians uniform. He is more notably known for his managerial work with the Tribe. Basically, he was sucked into the vortex that was the Tribe of the 80's, and he was let go in favor of John Hart. Gotta go with Bip on this one based on the card alone. That is a great action shot.